The Donegal Insurance Group story began in the small town of Marietta in Lancaster County, Pennsylvania, where a small group of farmers came together to provide mutual protection for their farms and property. On May 13, 1889, James A. Beaver, Governor of the Commonwealth of Pennsylvania, issued Letters of Patent to the Donegal and Conoy Mutual Fire Insurance Company, Marietta, Pennsylvania. Donegal and Conoy Mutual Fire Insurance Company issued its first insurance policy to a local farmer for dwelling coverage in the amount of $4,300. The annual premium was $3.90. The new insurance provider offered a very limited product line and only serviced a small area in central Pennsylvania. In 1919, as the company continued to grow, Donegal and Conoy purchased its first office building in downtown Marietta. By 1920, the company adopted the tagline “Adjustments Made and Losses Paid Before the Sun Sets.” The company’s growth would continue through the next three decades as its base of operations expanded. The 1930s saw many changes at Donegal and Conoy, all beneficial to the growth of the company. Its first major accounting system was installed. Plans were made to remodel the office building to provide adequate facilities for the growing company. And the first “catastrophe” reinsurance coverage was purchased. 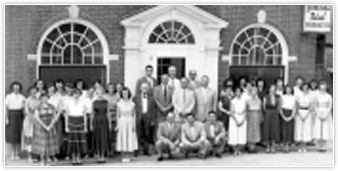 As the company celebrated its 60th anniversary in 1949, premium writings had risen to over $600,000, the Marietta office was expanded, and a new name was adopted, Donegal Mutual Insurance Company. In the early 1950s, Donegal Mutual expanded its product offerings to include automobile insurance, broadening the capacity for its agents in Pennsylvania. In 1952, the company installed its first IBM accounting equipment, and Donegal Mutual began writing homeowners policies using this equipment. In 1954, premium writings eclipsed the $1 million mark, a total that would grow to over $3 million annually by 1961, when construction was completed on the original portion of what is today the Donegal Insurance Group’s corporate headquarters. The year 1976 brought additional growth and expansion to Donegal Mutual, with the acquisition of Reading Mutual Insurance Company, a small mutual company in Berks County, Pennsylvania, and Laurel State Mutual Insurance Company of Wyomissing, also in Pennsylvania. In this same year, Donegal Mutual’s premium writings surpassed $20 million annually. 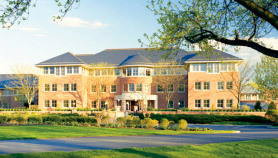 In the early 1980s, Donegal Mutual continued to expand by moving into the neighboring states of Maryland and Delaware. In 1984 Donegal Mutual acquired the charter of Southern Mutual Insurance Company in Virginia, known today as Southern Insurance Company of Virginia. In 1986, Donegal Mutual formed a downstream insurance holding company, Donegal Group Inc. (An insurance holding company is a business corporation that owns insurance companies, but is not an insurance company itself.) In addition, Donegal Group Inc. completed an initial public offering of common stock, with Donegal Mutual retaining a majority interest. Two classes of common stock of Donegal Group Inc. trade on the NASDAQ exchange under the symbols DGICA and DGICB. Donegal Mutual continues to hold majority-voting control of Donegal Group Inc.
At this same time, Donegal Group Inc. incorporated Atlantic States Insurance Company as a wholly owned property and casualty insurance subsidiary. Atlantic States was originally formed to offer workers’ compensation insurance, but was soon bringing added value by offering an additional preferred tier of personal lines automobile insurance. Atlantic States also began to offer additional tiers of commercial products as the combined companies became even more competitive in the marketplace and began promoting its capabilities as the Donegal Insurance Group. This growth and expansion led to further additions to the Donegal Insurance Group’s corporate headquarters. An extensive addition to the front of the existing building was completed in 1989. During the 1990s, Donegal Group Inc. completed acquisitions of Delaware Atlantic Insurance Company, Pioneer Insurance Company (Ohio), Southern Heritage Insurance Company and Pioneer Insurance Company (New York). These acquisitions expanded the Donegal Insurance Group's abilities to provide insurance products in the operating regions served by these companies. In 2001 and 2006, Donegal Group Inc. streamlined its corporate structure by merging several subsidiaries. In 2001, the mergers of Delaware Atlantic Insurance Company and Pioneer Insurance Company (New York) into Atlantic States Insurance Company were completed. In 2006, the mergers of Southern Heritage Insurance Company into Southern Insurance Company of Virginia and Pioneer Insurance Company (Ohio) into Atlantic States Insurance Company were completed. With a growing agent and employee population, the Donegal Insurance Group recognized the importance of providing a quality training facility for employees and agents. So in 1998, its training center opened in Marietta. Many employees and agents have benefited from the quality educational programs the Donegal Insurance Group provides at this facility. The Donegal Insurance Group’s Midwest expansion strategy entered its next phase in 2002, as Donegal Group Inc. acquired Le Mars Insurance Company, providing access to four additional Midwestern states. In 2004, Donegal Group Inc. acquired The Peninsula Insurance Company and Peninsula Indemnity Company. The Donegal Insurance Group’s commitment to automation and ease of doing business prompted the 2004 construction of a new Technology Center as an addition to its corporate headquarters. WritePro, an automated Personal Lines quoting, underwriting and issuing system, was released in 2005. The second generation of that product, featuring online access to this powerful agency tool, was rolled out in 2006 to favorable reviews. In 2006, the Donegal Insurance Group also introduced WriteBiz, a Commercial Lines automated quoting, underwriting and issuing system. By 2005, the Donegal Insurance Group had seen tremendous growth, with written premiums of $423 million and combined assets of $872 million. The Donegal Insurance Group was doing business in 18 states, represented by close to 1,700 independent agents, and composed of six companies: Donegal Mutual, Atlantic States, Le Mars Insurance Company, Peninsula Insurance Company, Peninsula Indemnity and Southern Insurance Company of Virginia. In 2008, the Donegal Insurance Group’s continued focus on Midwestern expansion resulted in the acquisition of Wisconsin-based Sheboygan Falls Insurance Company, a property and casualty insurer underwriting both personal and commercial lines products. As 2008 came to a close, the Donegal Insurance Group’s overall premium writings were $457 million annually. The Group’s ongoing plan for prudent growth continued in 2009, as Donegal Mutual entered into an affiliation agreement with Southern Mutual Insurance Company. Through this affiliation, the Donegal Insurance Group added to its business in Georgia and South Carolina. The Donegal Insurance Group story is a one of steady, consistent growth, and the latest chapter in that story was written in 2010 when Donegal Group Inc. acquired Michigan-based Michigan Insurance Company, which conducts business in the state of Michigan with annual premiums written in excess of $100 million.